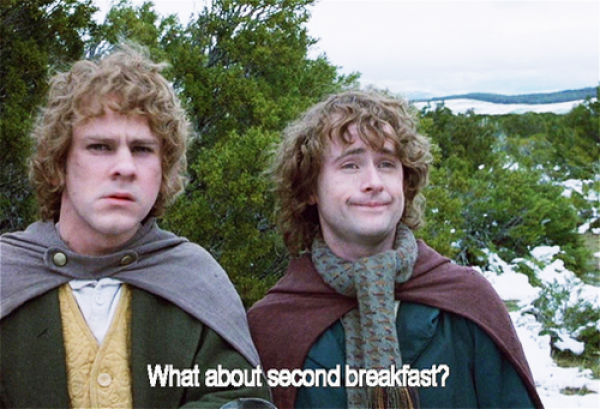 Oh how I love the Hobbit food schedule. So much time in the day to just sit back, relax, and EAT! What better way to spend your time!? So, without further ado I will present this next recipe so you can get to eating in time before the next hour! Heat 1 tablespoon olive oil over medium-high heat in a saute pan with a lid. Sear sausage on all sides. Turn heat down to low and simmer until sausage is cooked through, about 50 minutes. Boil potatoes and onion until potatoes are tender and strain. Return to pot and stir in cheese, butter, garlic, and heavy cream. Heat brown gravy in saucepan or microwave. Enjoy with some afternoon tea! Thank you for checking out Cooking4Noobs! I have visitied petitchef.com and have added my site! I hope you continue to see what other recipes I have in the future! T.M.Ninja Turtle: Pepperoni & Cheeeese Pizza!